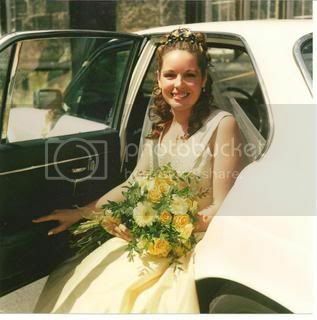 Following on from "I want to get married again topic"
and being slightly nosey - lets see your wedding pics. Oh sarah they're absolutely gorgeous! You look stunning of course!!! 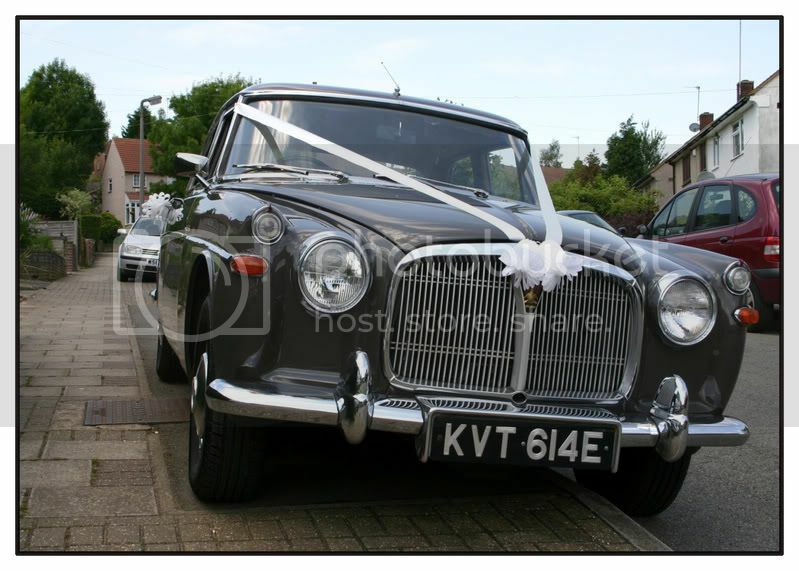 That cake is fantastic and i wish my dad had a car like that!!! I don't have my pics on the comp so it will take a few days but i'll try and put some on!! I have no pics on my pc sorry. But omg I love your pics! 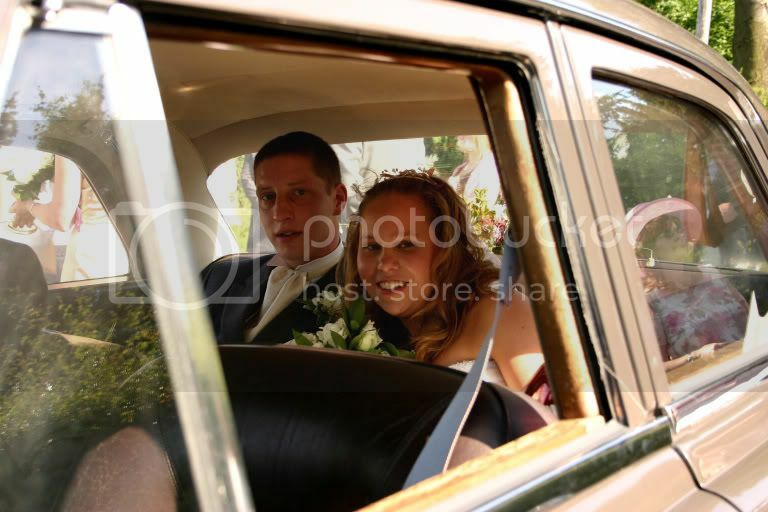 I love looking at peoples photo's. 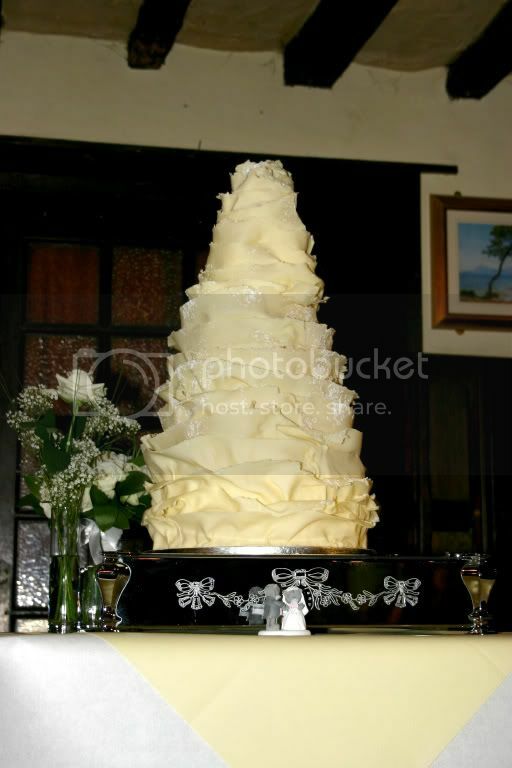 Your wedding photo's are lovely, you look amazing and that cake, wow!! awww thanks Girls, it was a lovely day and we were lucky with the weather - funnily enough the date of our wedding is normally glastonbury weekend but that weekend it wasn't on and the sun was shining - very lucky indeed. 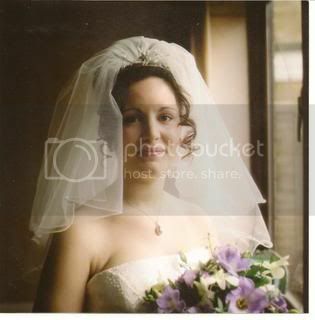 Just to point out I do not look like that everyday and was lucky to have a fab make up artist who worked on tv so mean't she knew how to make the camera pick up the best features etc. Can't wait to see all your pics - getting scanning girls!!! Wow! 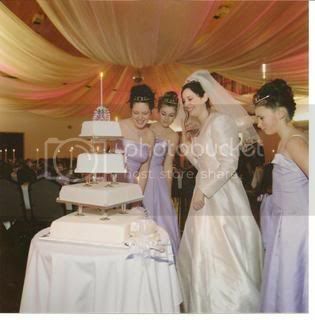 sarah, You looked amazing and THAT cake is unbelievable!! Will scan some piccies later! Here goes. (This was nearly 8 years ago!!) 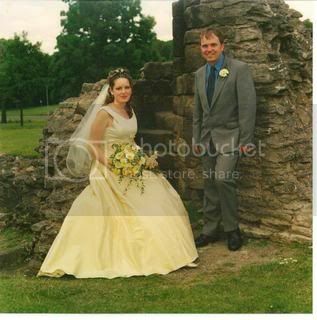 and HUGE apologies for the poor quality I've had to take pictures of my wedding pictures as I can't find where dh has put the scanner. Dh trying to flash my garter! Ladies, Love the photos! I love looking at things like this!! That cake is making my mouth water! It just looks so delicious! Am I the only woman who doesn't really care about the whole wedding thing??? 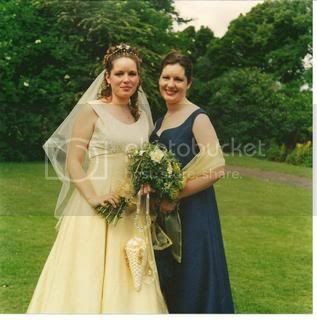 I love looking at other people's photos and going to other people's weddings however I just can't see myself as a bride. I am engaged and love Gareth to bits and know that one day it will be my turn, but I just can't get excited about it!! 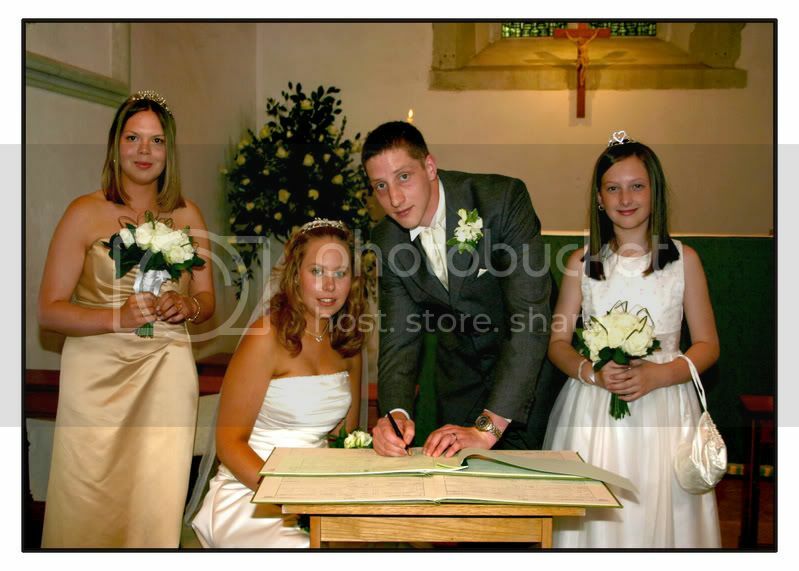 awww Caroline you can post pics of the christening then!!! mummyto4 - you look very happy in your photos and looks like you had fun! Any stories to tell? All I can say is it was a fabulous day. We had so much fun but it went in such a blur. There were a few minor hiccups but nothing major so the day was just fab! I am really looking forward to the Christening. I will definitely post me piccies for you all to see!! 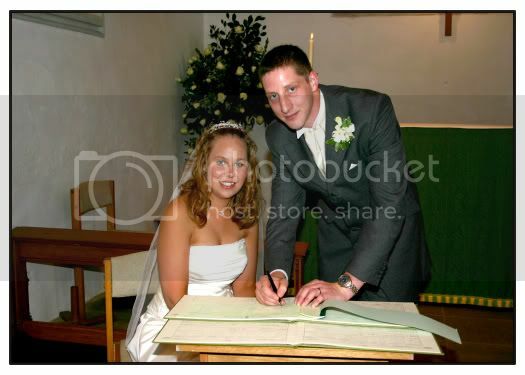 Can't believe this was 7years ago in June!! 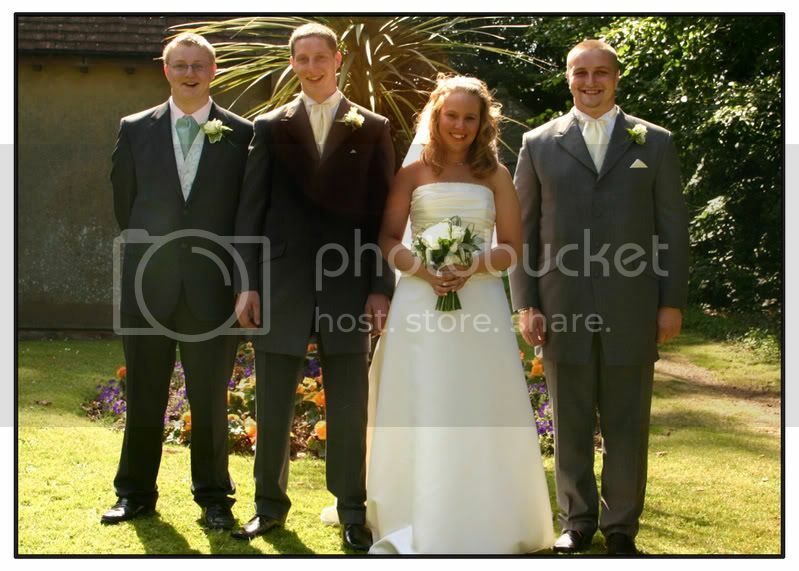 and here's Tashas big day, nearly 5 years ago! Tasha, Me and our 'little' cousins, Charlotte & Emily! They are fab!! I will try and do mine tomorrow. Oh Emma and Tasha you both look stunning!!! absolutly gorgous!!! You've really started something here Sarah!! this post will end up huge, because we're all puttung tons of photies on! It was a great excuse to get the album out again!